It is unfortunate that many of us live on low incomes and have to support families, pay bills and generally live day by day on salaries that in some instances just exceed the national minimum. With this in mind it is difficult for those of us who want to have a home of our own to do so and instead we must look at either renting or buying low income housing. In recent years low income housing has become something that many of us in the United Kingdom have aspired to; such housing may not necessarily be in prime locations but it is still much sought after. As the name suggests Low Income Housing is designed specifically for those individuals who have families and who fall into what is known as the ‘Low Income bracket’. Low Income Housing can be flats or houses and can be situated in any locale, more often than not built upon Brownfield sites where previously economically viable premises may have stood such as factories, office blocks, etc. Am I Eligible for Low Income Housing? Many people are already in receipt of housing benefit from the government which assists with the paying of rent on council houses. This benefit is not money you will actually receive yourself but instead is paid directly to the council or housing association whose property you are currently inhabiting. Housing benefit is paid to families on low incomes, single parents or individuals claiming other benefits which are paid to them if they cannot work. If you are not in receipt of such benefit then you could qualify for Low Income Housing if you are a single parent or part of a partnership looking after children whilst out of work. The criteria is very much dependent on that set forth by your local authority so it is best to seek their advice. 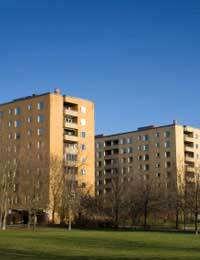 What Happens if I am Eligible for Low Income Housing? Depending on your circumstances the speed at which you are offered Low Income Housing will vary. If you are a single parent with a child then you may qualify for Low Income Housing faster than someone who, say, is simply unemployed. Likewise if you are homeless then you may qualify more quickly for such housing. Your circumstances are – as we have already mentioned – most important and bring great relevance to the validity of your claim for Low Income Housing. Where Might the Low Income Housing be Situated? Again this is a question that only your local authority can answer. When you are offered a home on the Low Income Housing scheme you will be asked to view the property first and give your opinions on it. You can refuse any offer of housing that is made to you by your local authority or housing association but you should be aware that in doing so your position on the waiting list will change and you will most likely be dropped back down the list until another more suitable property becomes available. It is important to remember that the locale of the property you have been offer is not necessarily the most important factor although if you are a single parent with no means of transport this can be an issue. I want to Apply for Low Income Housing, What Should I Do First? Initially you need to make sure you are eligible for Low Income Housing and the best way to do this is to approach your local authority. If you are in receipt of benefits – as we have already mentioned – you may be automatically eligible for Low Income Housing but it is always best to check. If you are in doubt you should speak to your local authority’s housing officer who will help you fill out the necessary paperwork or you can speak to your local Citizen’s Advice Bureau. Hi, I and my husband have 2 children and we live in a share tenant 3 beds house. we live in the same room with our kids and I am pregnant too. The other family who we share the home with are moving next month. My husband has low income and I am not working for the moment because I am taking care of my 2 years old child. We receive universal credit and we spoke to the land Lord to stay in the home longer with support of universal credit paying the other half of rent. But our land Lord is not happy and find it difficult to trust payment with universal credit. I am looking for another place to move which is affordable for us. can you please help us? Hi, I am currently pregnant privately renting a two bedroom flat with my partner, toddler and my sister who has come out of social care. My sister has taken one of my bedrooms as she lawfully requires it so myself my son and my partner are all sharing one room. We will soon be sharing this one bedroom with a newborn, toddler partner and myself. We work full time but can not afford to save the required first months rent and deposit that privately rented properties demand. We cannot live in this property as the four of us let alone a newborn coming in, how do we get help to pay for the first months rent and deposit for a new property? I can only direct you to the Turn2Us site here , for you to see whether there is help available. Hi, I have 2 daughters 3 and 4(almost 5) who currently live with my partner. We are in a relationship but we can’t afford to live together as I have a low (£14.000) income and she relies on benefits due to disability which makes her unable to work. We both provide care daily and are both financially responsible for our girls. It is frustrating not to be able to live together yet as my income would not support us all and my partner would lose vital money provided via benefits if I was to move in with her and or get married. Would I be eligible to apply for affordable housing? Or have assistance with rent on a 2/3 bed property. Any housing would have to be wheelchair accessible due to my partners needs. Thanks in advance for any advice. I'm currently lie with my son I moved out of the area in eltham moved to Liverpool North but moved back to Eltham cause of moving out of area I wasn't aloud to be rehoused they tod me to go private which I can't afford as I only work 30hrs.can I be housed by anyone I don't want to live in a room I really want a place for me studio flat I don't mind I have furniture with is just piled up in the bedroom I sleep in. I am in my 30's, have no children and work full time but have large outgoings through previous credit which I means I have limit disposable cash. I currently live with my parents but cannot continue to stay there. Is there any help for my situation? My current living situation has become very tense and is causing a huge impact on my mental health and is causing strain within the family. Any low-income housing would be awarded firstly to people with families (i.e children to look after). There is no provision for single people. Have you through of a house-share or another private way of sharing until you can settle your debt. Alternatively, you may wish to find debt advice via the link here. Hi, I have a 1 year old toddler I have recently split with my partner and has to leave his house I am currently living with my parents who do nott have room for me in their house. Will I qualify for a council flat. I work part time and I cannot afford such high private rents. Hi, I've recently lost my house due to a house fire& I'm wondering if I'm priority. I am on a low income as I work part time, how do I go about this and what help is available to me? You can see what rights you have if your rented home is damaged by fire via the Shelter link here, which should tell you all you need to know. Hi my partner and I have recently been evicted from a rented house in Northamptonshire and have decided to move back to Hertfordshire to be back amongst our friends and families. We are sofa surfing at present and have both signed on for jobseekers allowance. Since doing this my partner has found a full time job in welwyn gdn city and after an interview today I may also have a job . We have been working out how much we might be able to afford to rent a place on the wages we may be getting which would work out at around 1500.00 per month but on doing the sums when considering bills plus my partners child maintainable for his 2 young children it looks like we won't be able to afford more than around 500.00 per month and private let's in this area are way more than this would we be eligible for any kind of help ie affordable housing from the local council and if so how would we go about finding such help. Hi I am looking for a room or a studio flat to rent. I am married and husband in prison so I'm classified as a single parent. I am unemployed and no income and only in receipt of child benefit and child tax. I have been staying with my mother father and brother in a 2 bedroom flat but I need to move out soon as they will be moving to smaller property due to the rent being high at thr current flat and I will have to part ways from them. I'm not entitled to receive income support or jsa. I have a 2 month old baby girl and I need a property to rent, even a room would be okay. My question is, would I be able to find a room available to rent on Child tax and Child Benefit? What can you advise? Hi,I am a single mother of one (4 years old) I have been homeless for almost 3 years, we have been sofa surfing since being made homeless by the council. I was in temporary accommodation for a year and the council wanted to move me into further temporary - I refused as it was a huge inconvenience and disruptive which resulted in being discharged from duty.I have since been told that they will no longer help me and I have to look for private housing. The rent is far too high even with a full time income and all landlords will not accept someone on local housing allowance.I'm at my wits end and I do not know where to turn and can't stay where I am for too much longer. My daughter has since started at a local school and leaving my job is not an option. I have been in contact with shelter from the beginning but I've gotten nowhere.The council advised me to contact social services but I don't know how much they can help. Any advice? I'm afraid it is very difficult to answer this question as we are only a general guidance site that can only help point you in the right direction. We are also limited by the fact that you have been through the 'system' and it has failed to and/or refuses to help you find a home even though as a one-parent family you are a priority need. Your local MP, and/or local newspaper (who may view it as a new story) may be able to help in this sort of situation where you have slipped through the net. I hope this helps. Hi, I am a single mother of one (4 years old) I have been homeless for almost 3 years, we have been sofa surfing since being made homeless by the council. I was in temporary accommodation for a year and the council wanted to move me into further temporary - I refused as it was a huge inconvenience and disruptive which resulted in being discharged from duty. I have since been told that they will no longer help me and I have to look for private housing. The rent is far too high even with a full time income and all landlords will not accept someone on local housing allowance. I'm at my wits end and I do not know where to turn and can't stay where I am for too much longer. My daughter has since started at a local school and leaving my job is not an option. I have been in contact with shelter from the beginning but I've gotten nowhere. The council advised me to contact social services but I don't know how much they can help. Any advice? Please see Shelter link: How to rent when a landlord won’t accept housing benefit here. Please also keep in mind that according to Citizens Advice, if you pay rent to a private landlord, the rent your Housing Benefit can cover will normally be restricted to an amount set by a rent officer. If you rent from a social housing landlord, such as the council or a housing association, and you are working-age, the rent that can be covered by housing benefit will be restricted if your accommodation is considered to be too large. Therefore, be careful if you have only one child and you are applying for a three-bedroomed house as this may affect the benefit you receive. Hi, I have a wifevand two children aged, 19 months and 4 months, Me and my partner are on benefits ESA as a joint claim (she is on my claim) We are living with my partners mum but we have to leave as instructed by her mother, we are going to become homeless within the next few days weather we like it or not, the council said we could go private but we can not find one place on the internet who can accept us for DSS and without a bond we hardly get enough to live on plus we pay a lot of board to her mother, what options could someone PLEASE HELP with Thank you. Regards William. I am a single parent with a 12 year old and we have been homeless for 9month. ; We have been sofa surfing,for the last 9months. I work full time on low wage cant afford the rents in london. If I move out of london that would mean giving up my job which is not an option; and the cost of commuting would put me back in the same situation. At breaking point because have called all the advice lines and I feel like a headless chicken as it feels like Peter sends me to Paul, Paul sends me to Tom who sends me back to Peter. Do not know what else to do. I am sorry to hear this and I hope I am not sending you back to 'Peter' in my advice. You are in a very difficult situation because of the current housing situation in London and the fact that those who are on a low income are finding themselves completely outpriced when it comes to rent due to the squueze on housing. Have you thought of sharing? It's not an ideal situation, I know, but perhaps if a group of working single mums got together then this may solve your situation temporarily. Perhaps answering a similar ad on the likes of Spareroom or Gumtree may help, also please read Guardian link here. Of course Shelter may help, please see link here, which I imagine you may have tried, but as a single mum you are classed as having a high priority need and the council may be under a legal duty to provide you with emergency accommodation whilst it considers whether it has a longer term duty to rehouse you. Does your company only operate in London? If not could you put in for a transfer? Again not ideal, but many people are having to think on their feet these days. Contacting a national newspaper may also help, especially if you have a story you need to get out there and is in response to the cuts and inflationary rents. I hope these few of suggestions help and you manage to find a solution soon. Good luck. Looking for a 2 bed flat is extremely difficult. Either affordable homes are all gone as I am on a low wage or you need to earn 2/3x the rent. I am a single parent of a 2 year old and have a private rent house in almondbury, it is 400 a month and it is stressing me greatly that I can not look for work as I will not be able to afford to pay my rent. As specified in the article, if you are in receipt of benefits you may be automatically eligible for Low Income Housing. You can also see if you may be entitled to benefits while you are working via the Turn2Us link here. I hope this helps.